In a new study, reported in the journal Nature Geosciences, University of Illinois geologists, Lijun Liu and graduate students Quan Zhou and Jiashun Hu used a technique called seismic tomography to peer deep into the subsurface of the western U.S. and piece together the geologic history behind the volcanism. Using supercomputers, the team ran different tectonic scenarios to observe a range of possible geologic histories for the western U.S. over the past 20 million years. The effort yielded little support for the traditional mantle plume hypothesis. Recent stories in the national media are magnifying fears of a catastrophic eruption of the Yellowstone volcanic area, but scientists remain uncertain about the likelihood of such an event. To better understand the region’s subsurface geology, Uof I geologists have rewound and played back a portion of its geologic history, finding that Yellowstone volcanism is more far more complex and dynamic than previously thought. The teams goal is to develop a model that matches up with what they see both below ground and on the surface today. “We call it a hybrid geodynamic model because most of the earlier models either start with an initial condition and move forward, or start with the current conditions and move backward. Our model does both, which gives us more control over the relevant mantle processes” says graduate students Quan Zhou. One of the many variables the team entered into their model was heat. 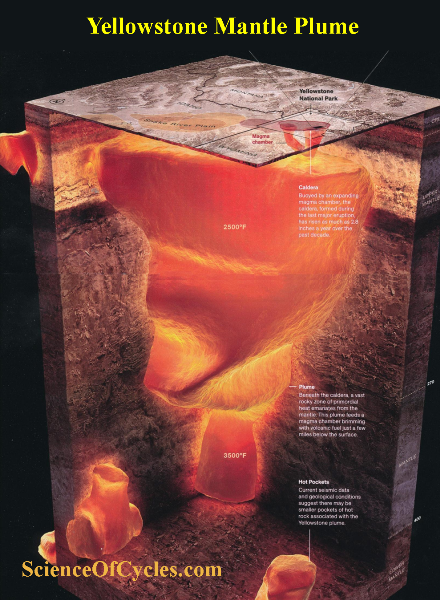 Hot subsurface material – like that in a mantle plume – should rise vertically toward the surface, but that was not what the researchers saw in their models.